INVENTORY CLEARANCE!! FANTASTIC DEAL INCLUDES NAMEPLATE!! 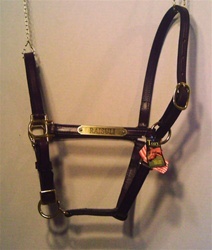 American made by Perri's - Stable Halter with FREE nameplate. 1" wide leather with adjustable chin strap and snap at throat. All solid brass hardware for beauty and durability. Comes with your choice of nameplate. 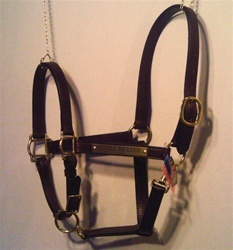 American made by Tory - Stable Halter with FREE nameplate. 3/4" wide leather with adjustable chin strap and snap at throat. All solid brass hardware for beauty and durability. 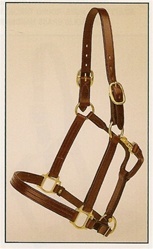 Horse or Cob/Lg Pony only - Havana color, with your choice of nameplate. Cob shown with 58. Made in America by Tory and Perri's, this triple stitched halter features solid brass hardware. Get 1 FREE nameplate of your choice with purchase. Available in black and havana in horse, cob and warmblood sizes.